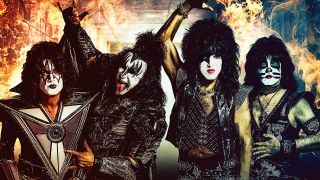 Kiss kicked off their End Of The Road world tour in Vancouver last night. The band shared a backstage preview of the set yesterday, and footage from last night’s performance at the city’s Rogers Arena has emerged, showed just how much work has gone into making this the “most explosive, biggest show” they’ve ever done. Radio personality and the host of Rock Talk, Mitch Lafon, was at the show and posted a shot of Kiss’ setlist from last night – and as you might expect, it was crammed with classic cuts. Those included show opener Detroit Rock City, Shout It Out Loud, Lick It Up, Cold Gin, Love Gun and Rock And Roll All Nite. Check out the setlist and live footage below. To create the massive stage show, Kiss brought 80 of their own crew with them, and employed a further 120 local crew to make the magic happen. A statement from the band said: “All that we have built and all that we have conquered over the past four decades could never have happened without the millions of people worldwide who've filled clubs, arenas and stadiums over those years.